The Cathedral of the Immaculate Conception is one of the oldest Catholic Cathedrals in the United States, and took almost fifty years to complete. After the Cathedral of All Saints, you can walk across Washington Avenue and venture through the Empire State Plaza. This gigantic piece of concrete is one of the lasting legacies of Nelson Rockefeller, the 49th governor of New York. If you get bored of the architectural repetitiveness of the Plaza, walk down Madison Avenue and you'll see a Gothic Revival building that seems out of place in all the post modern architecture. The Cathedral of the Immaculate Conception was the brainchild of Bishop John McCloskey. McCloskey, who had been using St. Mary's as his episcopal see (the base of the diocese), but felt that it was inadequate for Albany's growing Catholic population (this was due to the Potato Famine in Ireland). As a result, McCloskey convinced priests in the area to contribute to the cathedral as a way for many of the newly immigrated congregation to make this country their own in the face of nativist anger. The building itself broke ground in 1848, with the Gothic Revival design having been drawn up by an Irish architect , Patrick Keely, and while most of the cathedral would be completed within five years, it took another forty years for the twin spires to be built. 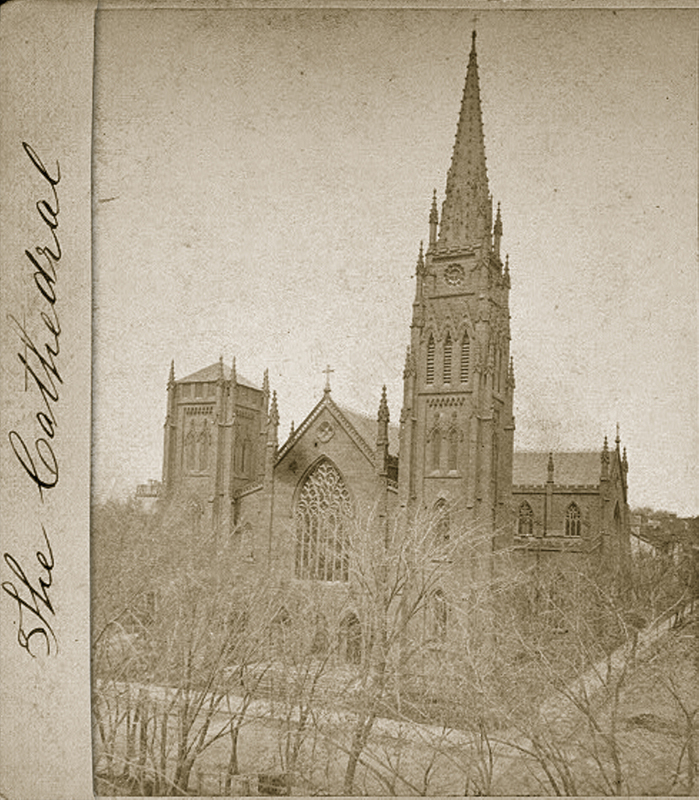 It was not until 1902 that the cathedral was consecrated, and after this, it fell into a state of neglect. The cathedral's state of disrepair would not be addressed until the 1960s, when the Empire State Plaza was being built. Most of the surrounding buildings were razed, and many families were displaced as a result. However, the cathedral was spared after Bishop William Scully convinced Governor Rockefeller that it was important to Albany's Catholic population. Over the following decades, the cathedral would be restored, and this continues into the present day. 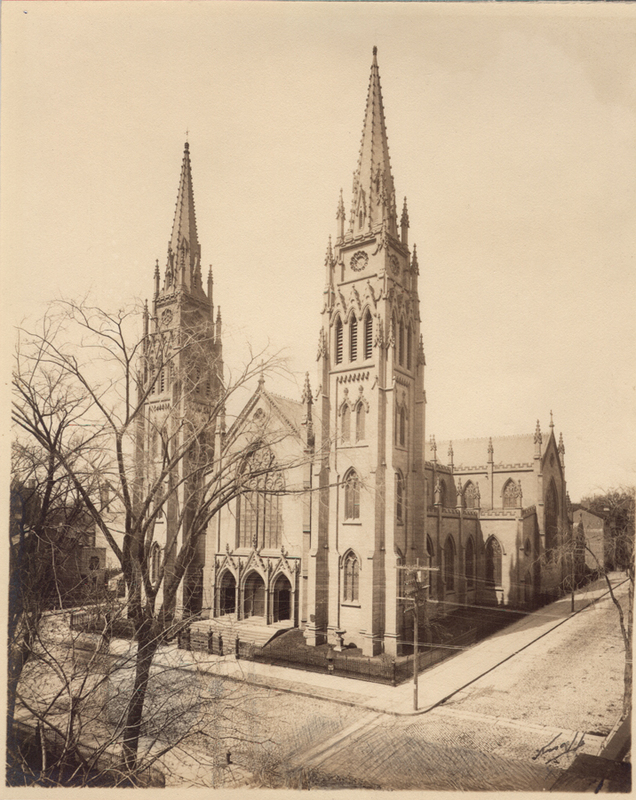 The Cathedral of the Immaculate Conception was added to the National Register of Historic Places in 1976. Matthew Chamberlain, “Cathedral of the Immaculate Conception,” Albany Walks for Health, accessed April 20, 2019, http://www.albanywalksforhealth.com/items/show/45.